Post season baseball begins this week and things are starting to heat up on the diamond for Florida State. The ‘Noles are locked in and looking to carry this feeling over as they begin ACC Tournament play on Tuesday. If they can play as dominantly as they did last year at the tournament, there is nothing that could stop this team from repeating as champions of the ACC. The ACC Baseball Tournament will return to Durham, North Carolina this year and all games will be played at the Durham Bulls Athletic Park. The tournament will feature a pool-play format. This will lead into a four team, single-elimination bracket that will ultimately decide the league champion. Tuesday through Friday (May 22-25) will be pool play where each team in the four pools will play once against the other two opponents in their respective pool. The four teams who win out each of their pools will advance to the semifinal game on Saturday May 26th. The winners of each of the semifinal games will then play on Sunday May 27th at noon for the championship game. The title game will be aired on ESPN2. Florida State will play in Pool C as the sixth seed along with the No. 3 seed NC State and No. 10 seed Virginia. FSU’s first game will be Tuesday at 3 p.m. against Virginia. Virginia is 28-24 overall and 12-18 in the conference. The Cavaliers won four conference series this year against Boston College, Virginia Tech, Louisville and Georgia Tech. The second game for FSU will be Friday Night at 7 p.m. against NC State. NC State is 40-14 on the year and 19-11 in the conference. Florida State recently played them in the final regular season series where the ‘Noles took 2 of 3 from the Wolfpack. NC State is a dynamic team both offensively and defensively and will be one of the toughest teams FSU will face at the tournament, and all season. One good thing for the ‘Noles though is that they have already played and know what to expect. Florida State just finished playing NC State last weekend and won two games from very exciting walk-off home runs from Steven Wells and Reese Albert. This will be an advantage for FSU since they already know what to expect. Both NC State and Virginia are tough teams to beat, but the way FSU has played the last few weeks is not expected to slow down anytime soon. When the bats are hot for the ‘Noles, things seem to go well. Last year at the tournament they played so dominantly on the offensive side of the game that there was no one able to get in their way. It was a huge step in the right direction for Coach Martin’s ball club and the intensity everyone saw last year is expected to be increased even more this year. The starting pitchers for the first two games will most likely be Drew Parrish and Andrew Karp. 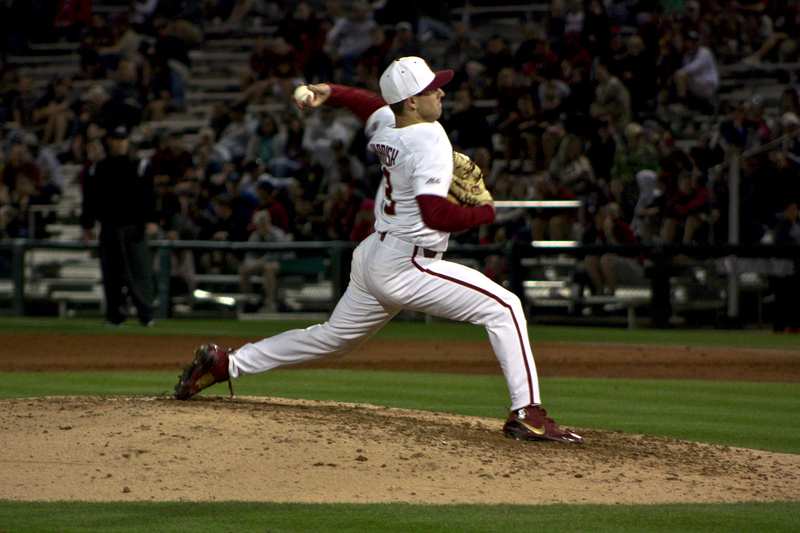 Against the Wolfpack last Thursday, Parrish pitched 7.2 innings where he had 10 strikeouts and gave up six hits. Parrish had a solid day and looked to be very poised against such a tough team. Karp went 8.0 innings where he earned seven strikeouts but gave up eight hits. Despite the number of hits and five total earned runs allowed, both pitchers ended up having a great outing and will be a huge reason for the Seminoles being successful in the ACC Tournament. Someone who has really come in clutch lately, especially in two instances against NC State, is freshman CJ Van Eyk. Van Eyk earned both of the wins for the ‘Noles last weekend under stressful extra-inning circumstances. The freshman is very tough on the mound and he seems to always get the job done. He is electric on the mound and always exciting to watch celebrate. Van Eyk and many other relievers will be another key aspect to the hopes of FSU being successful throughout this tournament. The Seminoles got a taste of what it is like to be in Omaha, to be champions of the ACC, and to have a successful postseason, and there are very few things that could stop them from doing it all over again this year. The quest for all of it again begins on Tuesday as the ‘Noles first face the Cavaliers at 3 p.m.